DJ-Suggester Plugin displays the box with suggested content from the currently viewed component. It works with Articles, DJ-Catalog2 Products, DJ-Classifieds Ads, K2 Items and EasyBlog Entries (more extensions will be added soon) and can also display modules. It shows up smoothly when website is scrolled to the bottom offset. 5 themes and easy theming system makes it's super easy to adjust to any website design. 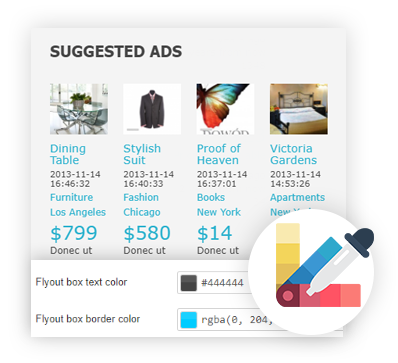 Easily customize the look and feel of the flyout suggestion box and its content with Color Customizer. With few clicks, you will be able to personalize the suggests that your visitors will see. Easily change colors of the background, texts, borders, buttons. You can even decide the colors of the hover effect. You can display any module in DJ-Suggester box by publishing it in dj-suggester-plugin module position. Use this option to set suggestion for other components such as Virtuemart by setting module to show items from current category or related items. The only limitation here is your imagination. Display sliding box with suggested content from Joomla! articles.